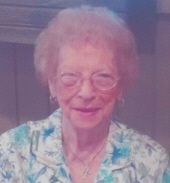 PEORIA – Norma J. Berger, 92, of Peoria, died on Thursday, October 4, 2018, at Proctor Place in Peoria. She was born on October 29, 1925, in Wyoming, IL, to Harry C. and Clara A. (Crutchley) Jett; both have preceded her in death, as well as her sister. Norma is survived by her longtime friend and caretaker, Gloria (Rod) Gillette of Peoria. She was the assistant vice president of bank tellers at Prospect Bank for 36 years before retiring in 1981. Norma volunteered for more than 30 years at Proctor Hospital and was active in the Proctor Service Auxiliary. Norma also served as treasurer in Peoria Heights. She later lived at Proctor Place and enjoyed playing card games with all her friends. Norma had a great love for animals and her pet dogs, Gigi and Susie. She was a longtime member of Peoria Heights Congregational Church. A funeral service will be held at 11:00 a.m. on Tuesday, October 9, 2018, at The Wilton Mortuary in Peoria with Pastor Brian Michael officiating. A visitation will be held one hour prior to the service at the mortuary on Tuesday. Burial will follow at Springdale Cemetery in Peoria. Memorial contributions can be made to her church or Proctor Place Health Care. "Email Address" would like to share the life celebration of Norma Jean Berger. Click on the "link" to go to share a favorite memory or leave a condolence message for the family.